Venting- Does it help with MIC? 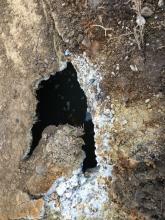 Some claim that venting a septic system prevents Microbe Induced Corrosion. How can venting to the atmosphere get rid of Hydrogen Sulfide gas which is heavier than air? Read more about Venting- Does it help with MIC? Why do so many agencies prefer prescriptive specifications? I’ve been told that 90% of the people who are served a bad meal in a restaurant just pay the bill without complaining. BUT, they don’t come back. 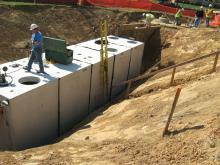 Most of my products deal with watertight precast structures. I recently had a guy complain that the sheets between the rolls of butyl would not release. He fought with every roll of sealant. Most guys would have put up with the problem, but not this guy. I went to see for myself. 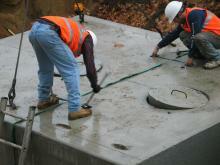 Molded of tough Urethane, the Dry Well Cones make the drain holes in precast pits. 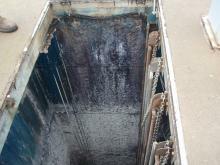 Seepage Pits, and Dry Wells collect water and gradually release it into the ground. 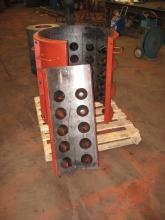 They are used to catch the water from down spouts, and some cases larger pits are used as Cess Pools. 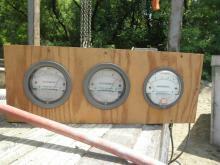 We prove that MACROFIBER Reinforced Septic Tanks can withstand H-20 Load Testing.